Now that I am established as a rugby writer of international repute (yeah, right) it is no longer a surprise when I am invited to attend press briefings for rugby events or to advertise or endorse various products to my vast readership. The stance I take generally is that this blog is merely a personal folly rather than something I do for commercial gain, largely because (a) it's true and (b) having worked in 'proper' new media in the past I am fully aware just how difficult it is to make more than a few pennies from online advertising. Despite my highly principled stand, however, I have to confess that I would never discourage anyone from offering me freebies in exchange for a word or two. I am nothing if not hypocritical when it comes to taking a moral position. 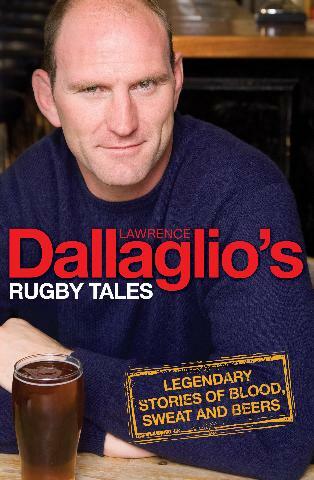 Thus I was happy to accept recently a free review copy of Lawrence Dallaglio's Rugby Tales. I say 'recently' - it was actually at the beginning of March. What can I say? I'm a slow reader. For the uninitiated, Rugby Tales does exactly what it says on the tin - it's a collection of musings from well and lesser known rugby writers and personalities focusing on the amusing and bizarre side of the game both on and off the pitch. Now, I'm not sure whether it's because several of the stories are already quite well known or because quite a few extracts from the book have already been published elsewhere, or perhaps whether it's because I am indeed a certified (or certifiable?) rugby geek with an insatiable appetite for trivia, but there was undoubtedly a whiff of familiarity about many of the stories. That said, there are certainly a few gems dotted around in the book too, including David Trick's account of how he managed to indulge in a beer and a cigarette on the pitch at Twickenham while playing for England Under 19s against Australia, as well as the late Richard Langhorn's comment during a Quins v Wasps match when his team mate and England captain Will Carling emerged from the bottom of a ruck demanding that the referee punish the player who had stamped on him. "Could have been any one of twenty-nine of us ref," said Langhorn. "Make that thirty," responded the referee.